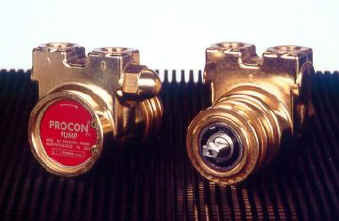 Series 1, 2, and 3 are available in 11 flow rates: 15, 25, 35, 50, 60, 70, 80, 100, 110, 125 and 140 gallons per hour at 250 psi. Clamp-on mounting style is shown in the photo; bolt-on mounting is also available. Dry Weight approx 2.5 lbs.